You've probably heard about the Waffle House Index, which is not, in fact, a barometer for how rowdy your night has gotten. It's a color-coded indicator used by FEMA that keeps track of whether Waffle Houses are open, closed, or operating with a limited menu to inform how bad the situations from weather hazards like hurricanes have gotten. Waffle House is used because they basically just don't shut down. 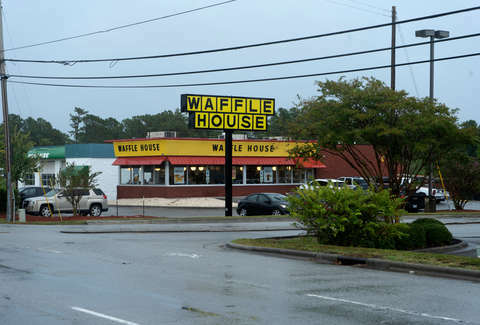 With this mind, it's incredible that in the wake Hurricane Michael, 30 Waffle Houses have temporarily shuttered. USA Today reports that there are 22 closed in Florida and 8 closed in Georgia. At least one of these was actually damaged when a billboard fell on the building, leading to shattered windows and dangling light fixtures. Most of the others are taking shelter from what's being called the third most intense hurricane to hit the continental US. Michael made landfall in the Florida Panhandle on Wednesday, registering as a Category 4 hurricane with winds up to 155mph -- which meant it was extremely close to being a Category 5. "The Waffle House test just doesn't tell us how quickly a business might rebound -- it also tells how the larger community is faring," a FEMA blog post cited by USA Today says. "The sooner restaurants, grocery and corner stores or banks can reopen, the sooner local economies will start generating revenue again -- signaling a strong recovery for that community." Waffle Houses are also often used to get resources to first responders, so the extent of these closures really is a testament to how serious this storm is.